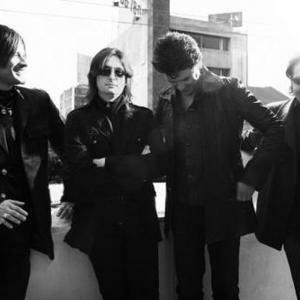 Jaguares is a Grammy and Latin Grammy winning Mexican alternative rock band formed by former Caifanes lead singer Sa?l Hern?ndez, after that band's break-up in 1995, because of personal differences with the Guitarist Alejandro Marcovich. He started the band along with former Caifanes co-member Alfonso Andr? (drums); and two long time friends Federico Fong (bass guitar) and Jos? Manuel Aguilera (lead guitar). Soon after the release of their first album, El Equilibrio de los Jaguares, Jos? Manuel dropped out of the band and Federico Fong took a break from the band, relatedly, as well. Sa?l and Alfonso looked for a person who could replace Jos? Manuel. After a period of time, Sa?l found the perfect replacement, C?sar L?pez Garcia, most famously known as "El Vampiro" (During Sa?l's time in Caifanes he once called "El Vampiro" to invite him to Caifanes, but his invitation was declined, because "El Vampiro" felt in a good position; He was in Azul Violeta during this time. He was also a member of Man? from 1991-1994.) The look for a guitarist was over, but the search for a bassist was still remaining. Sabo Romo, the ex-bassist of Caifanes, was invited to join Jaguares and he accepted. Sa?l added one more musician to Jaguares, Jarris Margalli; Jarris did keyboards and samplers. After the release of their second album, Sabo took a break from the band and Jarris was fired from the band, because Sa?l and Alfonso didn't need him in the band, since he was only doing small things in songs that were basically, needless. Jaguares got their name from one of Sa?l's dreams. He dreamt that he was singing in a jaguar's mouth. In 2007, Instant Karma: The Amnesty International Campaign to Save Darfur was released. It is a compilation album of various artists covering songs of John Lennon to benefit Amnesty International's campaign to alleviate the crisis in Darfur. In it Jaguares cover the protest song "Gimme Some Truth" from Lennon's 1971 album Imagine.